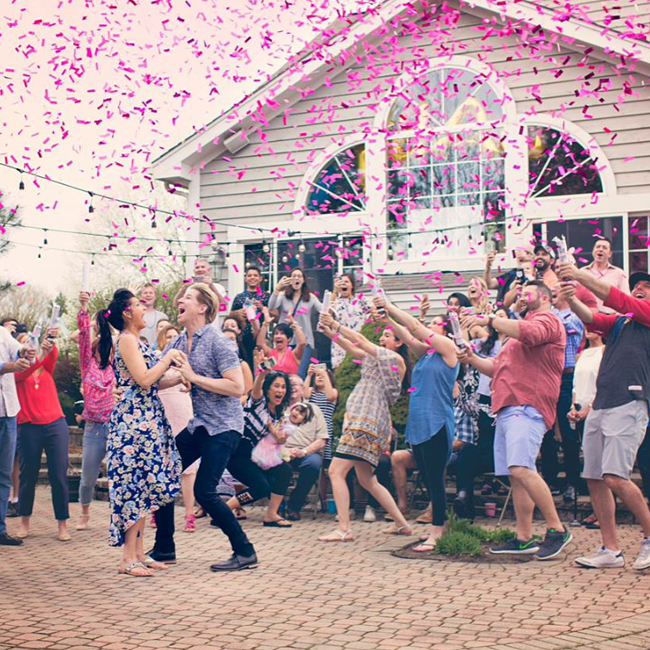 See the Latest on Gender Reveal Parties: Confetti Cannons! Have you heard about the latest way many people are announcing the arrival of their new baby? While many people are using wedding sparklers or even heart-shaped wedding sparklers as part of their gender reveal party, why not do something different and use confetti cannons instead! Instead of a shower of sparks, your guests will be treated to a shower of pink or blue paper and mylar confetti. Not only is this a lot of fun for you as a parent, your guests are sure to have a "blast" as well. If you want to go with the tried and true, you can always decorate your home with pink or blue ribbons, but who really wants to be "Captain Obvious"? You could always go with decorating the table, making cute colored boutonnieres for your guests to wear and play games with your guests to have them guess the gender of your baby, and maybe add in a few heart-shaped wedding sparklers; but this has been done so many times, it is almost mainstream. Why not try something truly different and start thinking outside of the proverbial box and lay out confetti cannons at each seat? Instead of announcing your baby's gender, you could have your guests simply fire off their cannons. Choose blue or pink and let them find out at the same time as a shower of the appropriate colored confetti floats around the room. If you are concerned about using confetti cannons in your home, there is nothing to worry about. With our confetti cannons, there are no flames, no smoke, no heat, nothing that could cause damage to your home or guests. Our confetti cannons use nothing but compressed air to blast their contents up to 15 feet in the air and are completely safe. If you have younger children who will be attending the gender reveal party that you don't want to have a confetti cannon, there is no reason why they can't still be part of the celebration. Instead of a confetti cannon, you can always give them one of our 10-inch wedding sparklers. These burn completely smoke-free and last approximately 45 seconds. These are just like the sparklers you let your children play with on the 4th of July and are perfectly safe as long as you supervise your children while the sparklers are burning and make sure they are placed in water once they are done. There is nothing more enjoyable than seeing your friends' faces light up with excitement when they twist the bottom of their confetti cannons to release a shower of brightly colored pink or blue confetti! The next time you have a gender reveal party, why not make it one to remember by giving everyone a confetti cannon from Wedding Sparklers Outlet! You are sure to put a big smile on everyone's face!